Elmo Johnson is one of my long-time friends. He has served as Pastor of Rose of Sharon Missionary Baptist Church in Houston’s Fourth Ward for the past 29 years. He is, however, not just Pastor to the members of his church. He is regarded as Pastor by many Fourth Ward residents who do not attend his church. It seems that everybody in the Fourth Ward knows Pastor Elmo. That’s because he is hardly ever in his office. If you are looking for Elmo you will find him walking slowly among the people in his community. 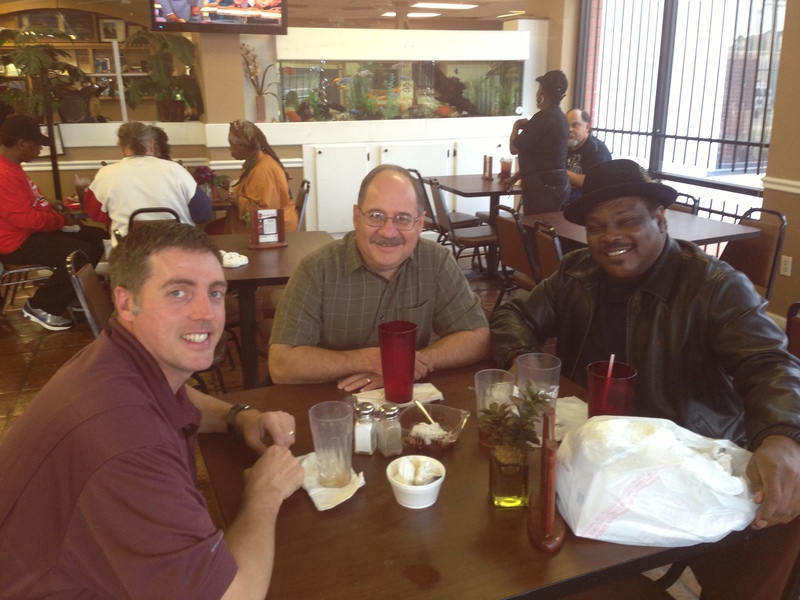 Last week, Jon Davis and I met Pastor Elmo for lunch at our favorite restaurant in the mid-town area — This Is It Soul Food Restaurant. I have eaten a hundred meals at This Is It over the years but I have never been able to eat everything on my plate because the portions are so generous. A few years ago the restaurant changed locations from the Fourth to the Third Ward. When we walked in to the restaurant everybody in the place, employees and customers alike, greeted Pastor Elmo. Hanging out with Elmo is like hanging out with a rock star. While we were enjoying our meal, Pastor Elmo told us about his Easter sermon. “You know,” he said in his trademark deep bass voice, “sometimes you preach a sermon and other times a sermon preaches you!” And then he proceeded to tell us about what he preached on Easter Sunday. The more he talked the more animated he became. Soon he was in full preaching mode. Jon and I noticed one customer in particular who was seated behind Elmo. He turned his chair and listened attentively, occasionally nodding in approval. When Elmo finished the recap of his sermon, the guy seated behind him got up, reached into his pocket, and put some money on the table. “That was a great sermon,” he said. “Since we don’t have an offering plate, here is a little something. I enjoyed that encouraging word.” And then the fellow walked out. Elmo gave the “offering” to our waitress, a single mom who is struggling to make ends meet. Our time with Pastor Elmo reminded me of St. Elmo’s Fire — a weather phenomenon in which a luminous electrical discharge appears on a ship during a storm. Sailors often considered it a positive omen. Elmo was certainly on fire at This Is It. In a day when so many Christ-followers are timid and afraid to talk about Jesus, Elmo is unashamed and unapologetic. He loves Jesus and does not hesitate to speak about Him both in and out of the pulpit. Elmo’s passion also reminded me that there is always someone who is either watching our actions or listening to our conversations. May we always keep in mind that many of the people around us at any given time are hungering for an encouraging word. So, live out loud and speak about Jesus with passion! You just might be the source of encouragement and hope that the guy sailing in rough seas needs in order to make it through another day. Omar, please tell Pastor Elmo, I will be Interceding for him, if he don’t mind. Will do, Gene. He is one of my heroes and a faithful servant. just read this now. Last night i was on the phone with a man who has a long history with the 3rd Ward. Elmo came up in our conversation. The guy was saying the same things you said about Elmo. I remember the first time you brought Elmo over to Generation One. He was in a suit and we had a handful of boys playing football. In no time Elmo was in a 3 point stance teaching the kids a thing our two!! Great word, Mike. I remember that day. Hope to see you soon. Thanks for your great work in the Third Ward.